Following its appearance at CES (Consumer Electronics Show) in Las Vegas in January, Magneti Marelli is repeating its commitment by participating in CES Asia 2018 which is taking place from 13 to 15 June in Shanghai. On stand 5072, located in Hall N5 of the Shanghai New International Expo Centre (SNIEC), the presence of Magneti Marelli is characterised by the theme “A part of your future”. In an overall area of approximately 240 square metres set out over two levels, the stand exhibits the latest innovations developed in the following areas: Advanced Responsive HMI (Human Machine Interface); Smart City Connectivity; Autonomous Driving Technologies; Intelligent Automotive Lighting and Advanced Powertrain Solutions. In the field of Electronics, the main focus is on the theme of HMI (Human Machine Interface), with the evolution towards multi-display systems, designed to integrate information functions with design, thanks, for example, to the solution involving connected displays creating a continuous surface. In particular, at CES Asia Magneti Marelli is presenting its vision of the E-Cockpit, a synthesis of technology which embraces the entire dashboard (dashboard HMI) in a single element which includes various displays, including the instrument cluster and the CID (Central Information Display). 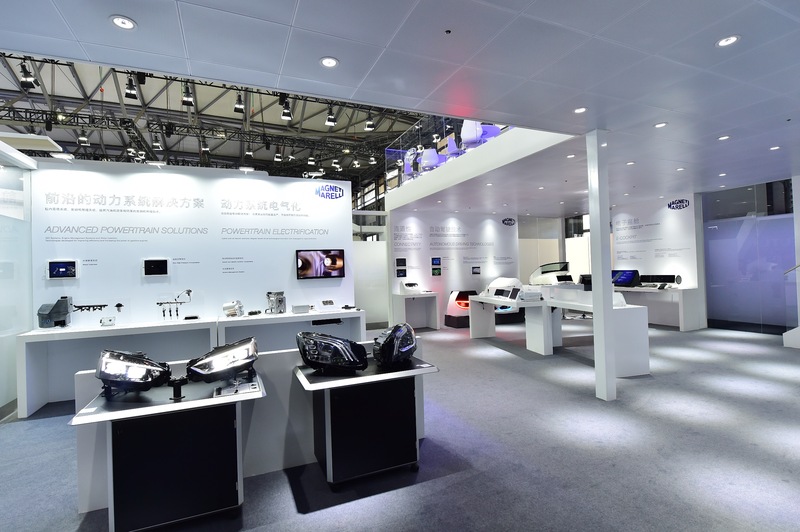 Again in the area of automotive electronics, in relation to the geographic context of the show, Magneti Marelli is placing particular focus on the technological know-how and production developed in the R&D centre in Guangzhou for the Chinese market. In particular, various solutions of the Full Digital Cluster are presented, with sizes ranging from 12.3” to 27”, dual displays and a demo unit which also includes the Heads-Up Display. There is also a demo presentation of the prototype for the Cockpit-ECU, characterised by a single processor which can simultaneously integrate and manage up to four screens with different operating systems and technology (LED, Touchscreen, etc. ), fitted with wider-ranging connectivity and combined in a continuous manner on the dashboard thanks to optical bonding technology. The Cockpit-ECU also offers the possibility to download a smartphone application created by Magneti Marelli, which is based on the Android system and which allows the telephone to become an additional screen, as well as control and personalise the on-board displays. Moving on to the area of Autonomous Driving and following the concepts which were expressed at the CES in Las Vegas, an important point in this area is the ability to detect and reconstruct, in real time, the environment surrounding the vehicle. To this end, Magneti Marelli is developing integrated solutions for the management of information from sensors which monitor the environment surrounding the vehicle via an Electronic Control Unit (ECU) dedicated to Sensor Data Fusion. Focus also returns to the Smart Corner solution, which integrates sensors for autonomous driving such as video-cameras, radar and LiDAR into the headlights and rear lights, at the same time guaranteeing elevated standards in lighting design and performance. Another fundamental aspect for autonomous driving is V2X (Vehicle-to-everything) connectivity, which is presented in an area next to that of Autonomous Driving. In particular, the stand presents V2X telematic systems which allow communication with other vehicles (V2V, Vehicle-to-Vehicle), infrastructure (V2I, Vehicle-to-Infrastructure), and pedestrians (V2P, Vehicle-to-Pedestrian). This area also includes the presentation of telematic boxes or T-boxes, modular telematic devices as both Original Equipment (OE) and for the Aftermarket, which allow in-vehicle access to connected services aimed at safe, comfortable and efficient mobility. Moving on to lighting systems, at CES, Magneti Marelli Automotive Lighting highlights the most recent synthesis of design and technology made possible with solutions such as LED and OLED. With regards to rear lighting, in particular Magneti Marelli presents the latest frontier in the evolution of LED technology and “light-guide” solutions which, combined, allow the creation of thinner diffusive material with a larger surface area, very similar to the characteristics of OLED. Furthermore, integrated electronics allow for adaptive backlighting functions. In terms of front illumination, there is a space dedicated to the latest generation of Electronic Control Units (ECU), which manage all of the intelligent actions of a headlight, for example the Matrix and adaptive functions, and the advanced digital management of the light beam. In the Powertrain field, in Shanghai Magneti Marelli is presenting solutions for hybrid and electric drive systems, as well as “Water Injection” and 1000-bar GDI (Gasoline Direct Injection) technology. The hybrid-electric area presents an air-cooled 48-volt “mild hybrid” solution with BSG (Belt-integrated Starter Generator). The complete “Water Injection” system for petrol turbo-compressor engines, is capable of injecting water into the combustion chamber thanks to an additional injector for each cylinder. This guarantees improved performance and efficiency, optimising operating conditions inside the combustion chamber and allowing for a reduction in CO2 emissions of approximately 3-5%. For GDI systems, Magneti Marelli proposes new pumps and injectors which are capable of operating at pressures up to 1000 bar, with a consequential improvement in performance and a reduction in consumption and emissions. Magneti Marelli’s presence at CES Asia 2018 is a further demonstration of the consolidated development of the company in China, where it is present since 1996 with production plants and R&D/Engineering Centres in Shanghai (The new headquarters recently inaugurated in May 2016, SAGW Powertrain JV), Wuhu (Automotive Lighting and Powertrain), Guangzhou (Electronic Systems, Suspension Systems and Automotive Plastic Components and Modules), Chagnsha (exhaust systems), Hangzhou (Shock absorbers in JV with Wanxiang Qianchao Company), Changchun (Powertrain and lighting in JV with FUDi), Hefei (exhaust systems with JAC and Lingdatang), Foshan (Automotive Lighting), and Xiaogan in the province of Hubei (China South Industries Group Corporation - CSI Automotive Lighting JV). Magneti Marelli designs and produces advanced systems and components for the automotive industry. With 85 production units and 13 R&D centres in 20 countries, approximately 43,000 employees and a turnover of 7.9 billion Euro in 2016, the group supplies all the major car makers in Europe, North and South America and the Asia Pacific region. The business areas include Electronic Systems, Lighting, Powertrain, Suspension and Shock absorbing Systems, Exhaust Systems, Aftermarket Parts & Services, Plastic Components and Modules, Motorsport. Magneti Marelli is part of FCA.